The first-ever DiamondFest, a gathering of admirers of the Jewish Elvis, showcased fan culture at its most fervent, the kind that makes people travel thousands of miles to bask in the collective ardor of their fellow worshippers. No, it wasn’t him—the solitary man in the spotlight was not the actual Neil Diamond. And yes, it was him—a version of him, anyway. It was Jay White, who bills himself as “America’s Diamond” and has also performed as the Jewish Elvis in more than 8,000 shows over 25 years. And I knew by then that my neighbor might be as excited about the surprise appearance of White as she would have been to see Diamond himself. For the first truth I learned at DiamondFest is that, as with all fan festivals, the gathering was as much a tribute to tribute artists as it was to the O.G. performer himself. The night’s showcase, the culminating event of the inaugural DiamondFest, was ostensibly a cast concert of Diamond Mountain, a film about Neil Diamond tribute artists that had premiered two nights earlier, kicking off the festival. Ten of the 13 acts profiled in the documentary were on the evening’s lineup, along with Jay White, a children’s chorus, and, for good measure, the Las Vegas Mass Choir. Even though this was DiamondFest’s first year, it plainly had the power to attract the faithful, to compel them to make the pilgrimage to Las Vegas for entertainment, merch, and—most importantly—congress with like-minded fellow travelers whose enthusiasms can match and even magnify their own. The comfort of community can be as strong a motivation to travel as the thrill of adventure. A fan fest offers community in its truest, most unadulterated form. In the absence of the actual star to receive the attendees’ collective adulation, they soak it up themselves, and it fuels them to express ever-wilder demonstrations of their fandom. 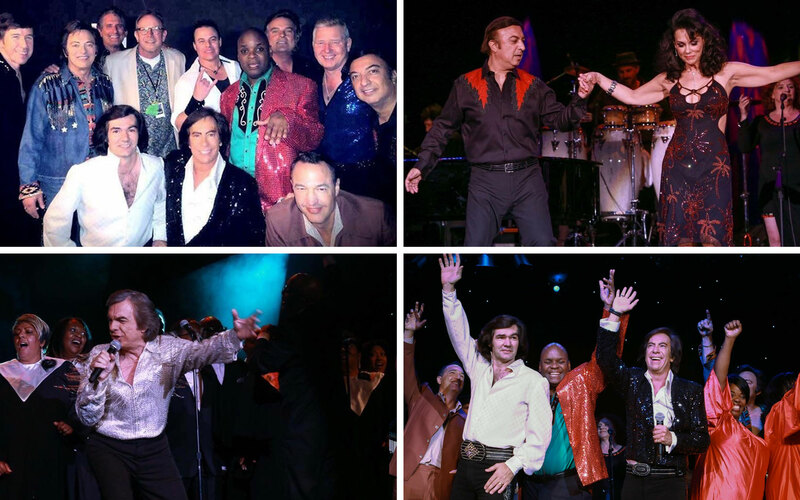 Clockwise from top left: The cast of Diamond Tributes; Chilean Neil Diamond tribute artist Carlos Picasso (left) performs "The Last Picasso" with dancer Rosanna Telford; Neil Diamond tribute artist Jay White performs "Brother Love's Traveling Salvation Show"; Diamond Tribute artists and members of the Las Vegas Mass Choir wave farewell after the DiamondFest finale concert. DiamondFest happens to take place in Las Vegas, but its excesses are the sort you indulge in at home with the music cranked up and no one watching. Its kin include events like The Fest for Beatles Fans, formerly known as BeatleFest, which has been keeping Fab Four fanaticism alive since 1974. There’s also Elvis Fest, which caters to fans of the King in all his various phases, and Michael Jackson ONE, an annual commemoration of the King of Pop’s birthday. Whatever superstar you consider your passion (or guilty pleasure) there’s likely either a fan fest dedicated to him or her, or one on the way. Consider that DiamondFest 2016 began on the day the news broke of Prince’s death. That night the Vegas tribute show Purple Reign immediately sold out, besieged by bereft fans seeking a communal catharsis. DiamondFest seeks to satisfy that same urge, in a celebratory way. Over two days and three nights there was a red-carpet film premiere; a tribute luncheon honoring Diamond’s longtime percussionist, King Errisson; a silent auction of memorabilia; a concert featuring “An American Trilogy” (Rob Garrett’s cabaret act, which weaves together Elvis, Frank Sinatra, and Neil Diamond impersonators) and the Real Diamond Band; and the culminating Diamond Mountain cast concert. The cavalcade of tribute artists was not only the weekend’s climax, but also is its quintessence. The entertainment may have been ersatz, but the enthusiasm most emphatically was not. Who cared if these musicians were cubic zirconia? They shimmered and dazzled and captivated so that you might not miss the absence of the one true Diamond. If you closed your eyes, they could convince you that you were in the presence of the genuine article. If you opened them, well, it depends whom you were watching: Some impersonators, with careful coiffing and wigs and exact replica wardrobes, emphasized visual verisimilitude. Others sounded the part but didn’t, or couldn’t, look it. Theron Denson is grateful to be one of the latter, as he testified at the Saturday night showcase. “God gave this one voice to a Jewish guy from Brooklyn and then he gave the same voice to a black kid from West Virginia,” Denson, better known as The Black Diamond, told the crowd before launching into a rendition of the 1972 hit ”Play Me.” “If that isn’t amazing grace, I don’t know what is.” When I met Denson, on the first night of DiamondFest, he was stealing a song. Walking across the entry to the casino’s multiplex in a bright-lime-green tunic, he jumped in and picked up the lyrics of “Girl, You’ll Be a Woman Soon” from fellow tribute artist Keith Allyn, who’d been singing a few verses a capella for my benefit. Although linked by vocation and love of the Diamond, Denson and Allyn were a study in contrasts—the former a full-faced bald-headed black man, the latter a lean, towering stoic with a helmet of blow-dried hair and skin as pale as his white tuxedo. Seen together, the array of tribute artists showed the Solitary Man to be a vessel into which his fans can pour their tastes. Depending on whom I asked, he was as a rocker, a balladeer, a country star, a romantic, or a patriot. Tribute artists, too, brought their own lives and biases to the material. To Curt Di Domizio, the Philadelphia-bred lead singer of Real Diamond Band, Diamond is a blue-collar hero. To Rob Garrett, the well-coiffed Vegas stage vet, he’s a swaggering showman. To Donn Lamkin, a former Disney actor who is making a musical inspired by Diamond’s music, he’s a Tin Pan Alley songwriter. I heard similar proclamations from performers and attendees alike all weekend. This is why you attend a fan fest like DiamondFest—to be unabashedly heartfelt among equally sincere peers. Because, with all due respect to the Suncoast Casino, it’s not for the food, golf, gambling, or luxe accommodations. Blessedly free of irony, DiamondFest is a place where earnest goes to camp. On Saturday night Carlos Picasso sang—what else?—Diamond’s 1974 single “The Last Picasso.” Like nearly every other performer, he finished his song frozen in what you might call Diamond pose—fist aloft and face turned toward the microphone. In front of me, closer to the stage, stood a cadre of fiftysomethings clad in matching tees that identified them as the Cherry Sistas, though the reception of their fellow Diamond worshippers showed that they needed no introduction. Their notoriety is a testament to the power of devotion, in which the degree of a fan’s ardor can bestow a brand of celebrity. Throughout the weekend, crowds parted for them. They were greeted with whoops from other fans and hugs and high-fives from tribute artists. In a crowd of super fans, they were the elite—but far from the only variety. There were also the ones who would crawl over the lip of the stage to grab hold of the singer’s hand or open their arms in the hopes of a hug and kiss. There were the sultans of swag, decked out in T-shirts, toting bags emblazoned with tour insignias and filled with albums, mugs, and other memorabilia. There were the shy, serious students of the songbook, for whom every refrain was a spiritual experience. 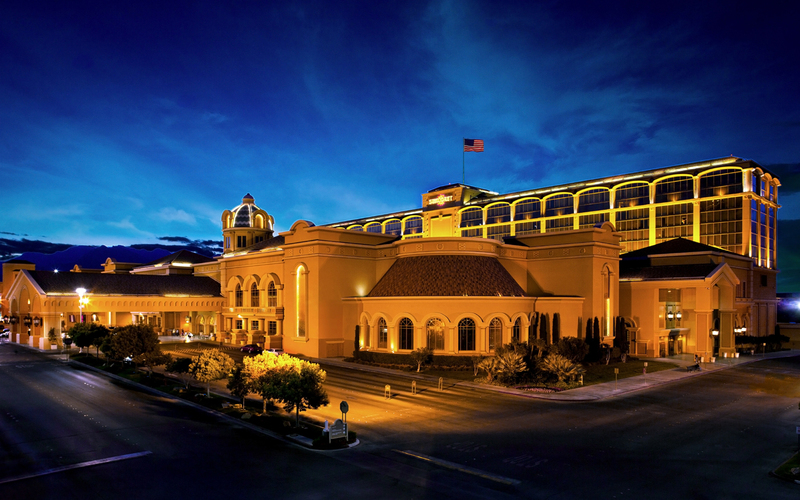 The Suncoast Casino in Las Vegas. What you could not find among the audience were dilettantes. However, if my experience is any indication, Neil’s army is quite welcoming to newbies. As the weekend wore on, I learned to revere their reverence. I tend to believe in Bill Murray’s quote from What About Bob? : "There are two types of people in the world: those who like Neil Diamond and those who don't.” Though not a Diamondhead per se, I count myself squarely among the former. At times it was easy to feel sheepish, not knowing every last deep cut. But more often DiamondFest offered me an immersion in the work of an icon and the infectious enthusiasm of his followers. The San Francisco–based Super Diamond plays a key role in Tatone’s film. At one point, Randy Cordero, a.k.a., “Surreal Neil,” tells an audience: “Whatever you do, don’t let anybody tell you that Neil Diamond doesn’t rock!” The story of Cordero’s fandom supposedly helped inspire the 2001 movie Saving Silverman, which centers on a Neil Diamond tribute trio. He and Super Diamond have met and performed with the actual Neil Diamond, not once but twice: at the Saving Silverman premiere party and at one of the band’s shows at the House of Blues in Hollywood. They have also performed at Boston’s Fenway Park, Denver’s Coors Field, and the Hollywood Bowl. If there’s such a thing as a crossover tribute act, they are it. Perhaps because of his notoriety, Cordero was invited to front the house band for two back-to-back numbers: “Desiree” and “Captain Sunshine.” Soon after, Denson strode onto the stage and belted out his second number, “Red Red Wine”—popularized by UB40 in the eighties but first recorded by Diamond in 1967. Keith Allyn followed with a full-throttle “Forever in Blue Jeans.” By the time Jay White made his surprise appearance, the entire audience was in a delighted frenzy. Steve Tatone is developing an expanded version of DiamondFest with a brand new element called “Serenade,” which he promises “will become the most amazing Neil Diamond musical experience short of an actual Diamond concert.” He is currently developing a DiamondFest website and finalizing 2017 dates. For further information, visit DiamondFest's Facebook page or email Steve at midnightpassent@aol.com.